Daddy Cool, bay Oldenburger Stallion by (Don Davidoff / Salida [Calido]), born in 2002, standing approximately 16.3 hands. A stunning outline combined with unique blood lines, Daddy Cool has more than proved his worth by winning the Oldenburg County Championships and qualifying for the National Young Horse Championships ‘07. Daddy Cool is remarkably talented, not only as a dressage horse but also as a terrific jumper. At his 30 day test he was awarded with the top scores for outstanding excellence in both disciplines. The demand for his foals is high – €32.000 was paid for the most expensive filly of the AOS-Auction ’06. Daddy Cool is a son of the approval and stallion performance test champion Don Davidoff, who caused furore when he became World Champion and German Young Dressage Horse Champion. Daddy Cool has a very interesting pedigree. 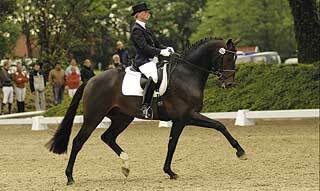 The Holstein Calido is known for improving type and rideability of show jumpers. Sandro adds that extra bit of noble blood. Daddy Cool’s dam line is one of the best the Lewitz stud has to offer and has produced, amongst many others, the successful stallion Balou du Rouet. We have high expectations in Daddy Cool’s career. His fabulously moving foals do him justice!